The all-new 2018 Maruti Suzuki Ertiga has been launched in India with prices starting at Rs. 7.44 lakh. The Ertiga gets both petrol and diesel engines. 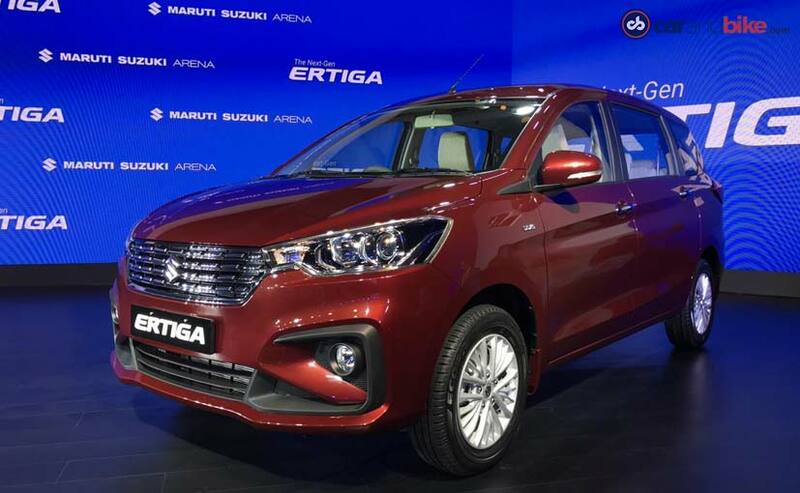 The all-new Maruti Suzuki Ertiga 2018 has been launched in India with prices starting at ₹ 7.44 lakh. 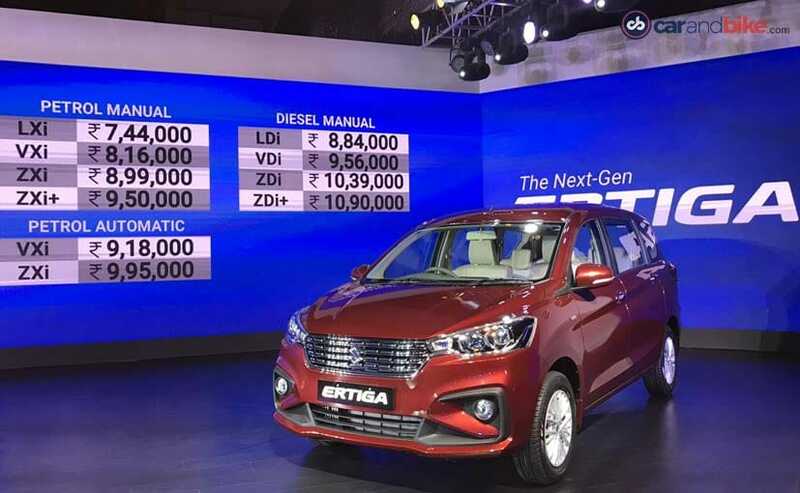 The new Ertiga will be available with a petrol and a diesel engine and while the petrol will get both an automatic and a manual gearbox, the diesel will only get a 5-speed manual option. The all-new Maruti Suzuki Ertiga is a seven seat MPV or multi purpose vehicle and is now in its second generation in India. New Ertiga prices for petrol manual models range from ₹ 7.44-9.50 lakh, while the Petrol automatic Ertiga range is priced between ₹ 9.18-9.95 lakh. The new 2018 Maruti Suzuki Ertiga diesel prices range from ₹ 8.84-10.90 lakh (all prices ex-showroom, Delhi). The new Maruti Suzuki Ertiga gets an all new design language that makes it a much much better looking car as compared to the previous gen model. The new Ertiga now gets headlamps with projector lens along with a set of boomerang shaped LED tail lamps that look very Volvo inspired. The new Ertiga continues to get 15-inch alloy wheels on the top spec models while 15-inch steel wheels with or without wheelcaps will continue on the lower VXI and LXI trims respectively. The new car also gets a new greenhouse design, which seems inspired by the larger and more premium Toyota Innova Crysta and seems to work really well. The new Maruti Suzuki Ertiga is a bigger car as compared to the previous generation. It is longer and wider, which means that there is more space in the interior for passengers and for luggage too. The new Ertiga packs more features with the likes of a touchscreen infotainment system with Apple CarPlay and Android Auto being offered on the top spec models. The new Maruti Suzuki Ertiga will have roof mounted AC vents for the third row and also get wooden inserts on the dashboard and steering wheel for a more premium looking interior as compared to the first gen model. The MPV offers a boot capacity of 209 litres, which can be expanded to 809 litres with the second third row folded. In terms of engines, the Maruti Suzuki Ertiga diesel continues with the same motor. The 1.3-litre DDIS 200 engine makes 89 bhp of peak power and 200 Nm of peak torque. The engine is mated to a 5-speed manual gearbox. The petrol engine on the new Ertiga is all new, a 1.5-litre K15 motor that is also available on the Ciaz. The engine makes 103 bhp of peak power and 138 Nm of peak torque. The engine is mated to either a 5-speed manual or a 4-speed automatic gearbox. Both the petrol and the diesel Maruti Suzuki Ertiga will also get the SHVS mild hybrid systems. Fuel Economy for the new Ertiga Petrol is 19.34 kmpl on the petrol manual and 18.69 kmpl on the petrol automatic, and on the diesel is 25.47 kmpl. The new Maruti Suzuki Ertiga will not be available with a CNG option as of now but will probably get one soon.